This is a rare opportunity to spend an evening with the Fly Gal herself at Sweetwater Brewing in Atlanta. 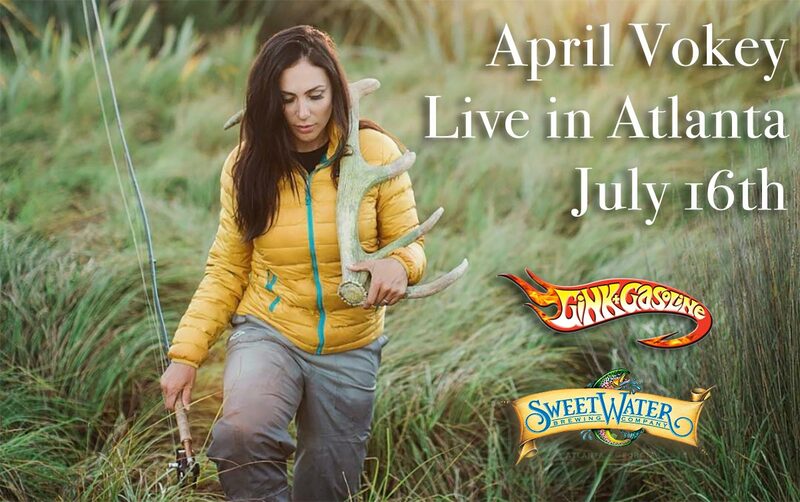 Gink and Gasoline is very proud to sponsor this awesome event, along with Sweetwater Brewing Co. It’s an opportunity for anglers here in the southeast to hear from one of the most prominent voices in fly fishing. In addition to April’s presentation there will be some great prizes, live music, a short film on the Chattahoochee and lots of great Sweetwater beer. April’s trip to Atlanta is for a great cause. She is here to support the local angling community in our efforts to save the Hooch. The proceeds from this event will go to the Chattahoochee Riverkeeper, a nonprofit organization dedicated to protecting and preserving the Chattahoochee River, its lakes and tributaries for the people, fish and wildlife that depend upon them. I’m personally pretty excited that our effort to save our local river is getting attention at an international level and attracting support of this caliber. If you are in the area, please come out and help support the Hooch. Our river need you now more than ever. SWEETWATER BREWING: 195 OTTLEY DR, ATLANTA, GA 30324. We recommend buying tickets online as we expect to sell out. The price of your ticket includes beer and food and goes to save the river we love. I hope you will be able to join us. I would personally like to thank April Vokey, Sweetwater Brewing, The Chattahoochee Riverkeeper and all of our sponsors for their good work and generosity.